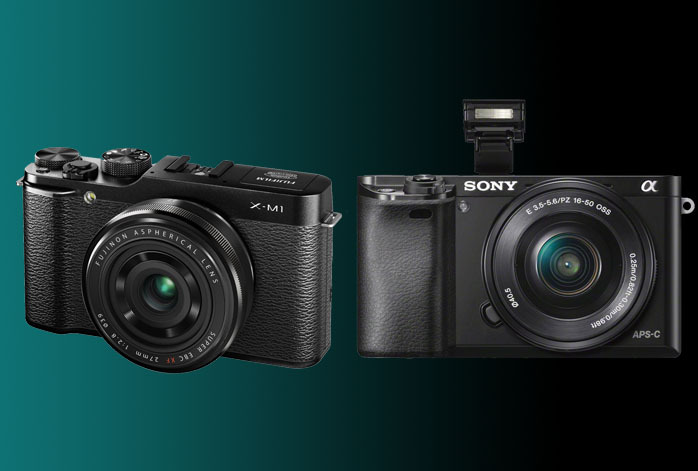 Some people can’t decide between Fujifilm X-M1 and Sony a6000 because they do feature various similarities. They each comes with built-in Wi-Fi, flash, also AE bracketing and continuous shooting. Even though Sony a6000 clearly has a higher number of pixels, Fujifilm X-M1 is cheaper, so people are wondering if this makes a fair trade. Are you having the same question? Read on to find the answer! Needless to say, Sony a6000 holds numerous advantages over Fujifilm X-M1. Sony a6000 is powered by a 24 MP APS-C CMOS sensor, with a maximum ISO of 51200 and a total 179 focus points. It boasts an exceptional continuous shooting speed of 11 fps. With such specifications, Sony a6000 boasts a huge versatility. It can capture sharp and well-detailed images, with very good focus over the objects. The high ISO and photo burst allow Sony a6000 to perform for different purposes, including sports and landscape photography. Fujifilm X-M1 is pale in comparison, with only 16 MP image sensor, 6,400 max ISO, and 6 fps photo burst. The gap is too significant. Both models indeed support AE bracketing, a useful feature for taking multiple shots with varying exposures in order to deliver high-contrast scenes. AE bracketing is beneficial in tough lighting conditions as well as in HDR photography. However, Sony a6000 is more reliable to generate better results than Fujifilm X-M1 because it has an AE bracketing range of plus-minus 5EV. Fujifilm X-M1’s is only plus-minus 1EV. Last but not least, Sony a6000 comes with a significantly larger buffer capacity than Fujifilm X-M1. As the effect, Sony a6000 can take more shots before taking a break, making it ready to serve for a longer time in long sessions. As the conclusion, we recommend you to stick with Sony a6000. The output quality and performance are simply much better than Fujifilm X-M1. It is also more versatile for different types of photography.